If your home is uncomfortably hot or you're dealing with expensive cooling costs, upgrading your air conditioning system is a smart investment. However, knowing the right type of air conditioner for your home can be more challenging. At Precision Air, we specialize in installing and replacing a wide variety of air conditioning systems, and we'll help you get the right solutions for your needs. We install energy efficient air conditioning systems that will help keep your home more comfortable while reducing utility bills. Call us today at 1-844-386-0719 or click below to get started with a free installation estimate. 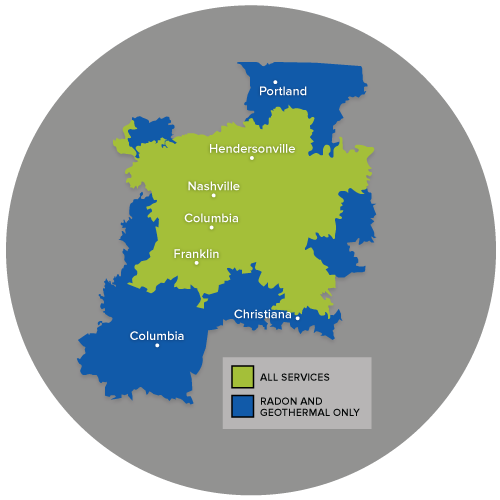 We off all our air conditioning services in Nashville, Franklin, Murfreesboro and nearby in Tennessee! There are several factors that affect what type of air conditioner is right for your home, including the size of the space, budget, existing ductwork, and frequency of use. Our experts will evaluate your home and help you choose the right system for your needs. Central AC systems still represent the gold standard for home air conditioning. In most cases, the ductwork system that delivers cool air throughout the house will distribute heated air during winter months. A central air conditioning system is not sized by BTU output. Instead, cooling capacity is given in tons. A ton of cooling capacity equals the amount of heat absorbed by one ton of ice melting over a 24-hour period (roughly equal to 12,000 BTU). Great gains in comfort and energy savings are possible when you replace an old central AC system with a new, high-efficiency unit. For example, a 10-year old AC system may only be operating at under 10 SEER, while new units are available that operate above 20 SEER. When AC maintenance and repair isn't providing the comfort or savings you want, it's time to consider upgrading to new equipment. Precision Air will also help you evaluate building envelope improvements that help to reduce your AC requirements. Portable AC units are small enough to be purchased and installed by the homeowner. In the portable AC category, you'll find window units that are totally self-contained and floor models that need to be ducted to a window. Most portable air conditioners use refrigerant just like whole-house systems. A smaller number are evaporative air conditioners that provide cooling by evaporating water. Portable air conditioners are sized by BTU (British Thermal Unit) output, with sizes ranging from 5,000 to 10,000 BTU. These appliances should also have EER and SEER ratings that measure energy efficiency (see sidebar). Portable AC units are much less expensive than other cooling equipment. But remember that you'll need multiple units to cool an entire house. Also consider the extra noise in each room and the fact that when installed, a window-mounted unit blocks the view and natural ventilation. As a Daikin Pro Dealer, Precision Air offers innvoative heat pumps that are garunteed to optimize your home's performance and provide elite heating and cooling capabilities. Daikin was established in 1924 and is committed to manufacturing state-of-the-art HVAC systems that are designed to improve your home. Daikin provides an outstanding line of products that improve indoor air quality, which is what makes us the leading manufacturer of air conditioning equipment. Our goal is for you to be comfortable, healthy, and happy. This has been our mission since 1924 and will continue to be our mission into the future. If you're interested in upgrading your home's air conditioning, the local experts at Precision Air are here to help. We provide complete air conditioning services, including repair, replacement and installation. Call us today at 1-844-386-0719 or contact us online to get started with a free estimate in Nashville, Franklin, Murfreesboro, Antioch, Hendersonville, Brentwood, Smyrna, Lascassas, Madison, Hermitage and the nearby areas!